1) Which one was Keanu in "Bill and Ted's Excellent Adventure"? 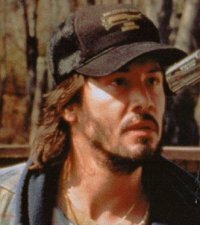 2) What was Keanu's character up to in "The Watcher"? 3) What sport did Keanu bet on, and lose an assload of money on, in "Hardball" when he was waiting outside the bar for the results? 4) What sin does Al Pacino use to try to get Keanu Reeves once again down the 'dark side' at the end of "The Devil's Advocate"? 5) In which movie does Keanu scamper underneath the girders of a moving bridge while evading law authorities that are trying to apprehend him? 6) Where did Keanu shoot his partner, in "Speed"? 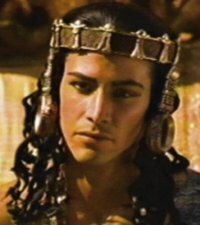 7) What Shakespeare movie did Keanu appear in? 8) In which movie did Keanue Reeves co-star with Charlize Theron? 9) In what movie did Keanu co-star with Patrick Swayze? 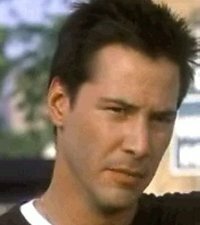 10) Which Keanu movie takes place in the year 2021? 11) In which movie does Keanu play a football player? 12) In which movie does Keanu play a police officer that ends up shooting his boss? Match the Keanu quote to the movie it was from. There are more answers than questions, so choose carefully. The last quote isn't really Keanu's, per se, except for his heavy breathing. Can't play sound? Read the quotes instead. 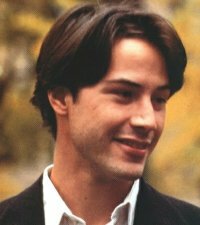 17 - 20) Who's that Keanu? Match the Keanu mug to the movie in which it was featured. Be careful, as there are extra flicks in the list to choose from!